In our Accessible PDFs from Acrobat training course we set out 10 must-know PDF accessibility linking techniques. Our blog post Creating accessible links in PDFs describes several of these techniques in detail. This post looks at a further aspect of accessible PDF links that document authors should pay attention to, namely link zoom settings. In short, except in a few very rare cases, all internal links in PDFs should have their zoom attributes set to Inherit. Doing so will ensure that the user’s page size or zoom setting will be preserved when the link is clicked. Unfortunately, this is not the default for links created in Acrobat. Acrobat typically generates links with their zoom attributes set to Fit Page, Fit Width or Custom, depending on the page zoom setting at the time the link is created. If you don’t set your zoom attributes to inherit, when you click an internal link (including table of contents links or bookmarks) the page is likely to shrink, sometimes dramatically so. This is obviously not a very user-friendly thing to do generally, and can be a significant inconvenience for people who need higher levels of page magnification. Fortunately, dedicated screen magnifiers such as ZoomText, MAGic and SuperNova all ignore the PDF link zoom attributes (or treat them as if they were set to inherit). However, this does not mean that there is no problem. 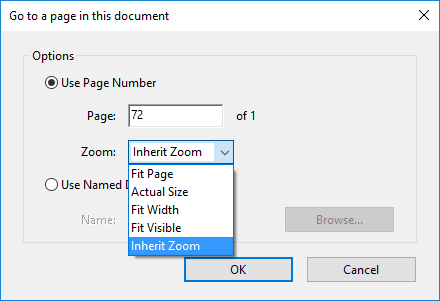 Screen magnifier users are likely to get the sharpest looking text in a PDF by resizing the page rather than relying only on the magnifier itself and so will experience some change in page/text sizing when clicking a link with any zoom attribute value other than inherit. It should be noted that some links cannot be edited in this way. These include InDesign auto-generated tables of content and bookmarks. These should always be manually generated in InDesign, using Hyperlink Destinations. Between this post and the previously mentioned Creating accessible links in PDF post we have covered most of our recommended 10 must-know PDF linking techniques. We will try not to leave it a further 8 years before writing another post detailing the remaining ones.